First introduced by the International Labor Organization's World Employment Conferences in 1976, the human basic needs model attempted to define the absolute minimum resources needed for long-term well-being: food, shelter, and clothing. Fast forward to 2015, and those needs have since been reevaluated to include Netflix, Starbucks and camouflage clothing. Yes, it's that serious. America is in the midst of a camo craze. Though the fashion industry is notorious for being fickle, there are quite a few trends that have earned the coveted title of being timeless. Among those trends are the quintessential little black dress, various kinds of denim jeans, a pair of killer heels, and now camo clothing, of all things. In an industry where swarms of budding fashionistas literally "can't even" with many new and upcoming trends, how do the camouflage clothes worn by the likes of Honey Boo Boo's Mama June and Duck Dynasty's Phil Robertson consistently earn a spot in the pages of the most prestigious fashion mags? It's versatility that lends camouflage clothing its mass appeal. The popularity of camouflage is far reaching and now deeply ingrained within American society and culture, and as with many fashion trends, has grown to represent activism as well as an entire way of life. Though camouflage clothing is worn by a multitude of people, its dual role as both a fashion trend and a cultural representation is perhaps most clearly seen today in the many rural communities that dot the American Heartland and the South, where hunting, fishing, and other recreational outdoor activities are simply apart of everyday life. Though the camouflage patterns worn by those who embrace what is now called the "country" or "hillbilly" lifestyle once served a very practical purpose, it has now evolved far beyond its strictly functional origins of concealment. For many, camouflage clothing isn't worn only to make a fashion statement, but rather it is proudly donned as an expression of the wearer's subculture and in this instance, patriotism. But in order to truly appreciate the high rank camouflage holds in today's ferocious fashion hierarchy, it helps to understand a bit more about its colorful history. The very first fashionistas to ever rock the camouflage trend weren't up and coming runway models or respected fashion designers; they were members of the animal kingdom. Certain species of reptile and squid are just a few of the many animals that use camouflage as way to blend into their surroundings to avoid detection -- an ability known as crypsis. This is done for several reasons, namely to stalk prey and also to avoid becoming a predator's next meal. Taking a cue from nature, early man often used branches, leaves, twigs, and mud to camouflage themselves as they hunted game; however, it wasn't until World War I when the armed forces of the French -- always known for being fashion forward -- formed a camouflage corp of artists to create a pattern that would allow their forces to remain undetected in the forests. The artists, known as, camoufleurs, created a pattern using carefully selected yet muted colors and shapes. This was a stark contrast to the regal, if not flamboyant, battle dress uniforms worn by the French in earlier eras. Even in its earliest stages, well before it ignited a fashion craze, military camouflage began influencing art and fashion by capturing the eyes and imaginations of notable figures such as cubist artist Pablo Picasso. In Gertrude Stein's memoir From Picasso, the author recalls the exact moment when Picasso first laid his eyes on this complex pattern. "I very well remember at the beginning of the war being with Picasso on the boulevard Raspail when the first camouflaged truck passed. It was at night, we had heard of camouflage but we had not seen it and Picasso amazed looked at it and then cried out, yes it is we who made it, that is cubism," Stein wrote. The pattern quickly became a success and was later recognized and adopted by other military forces. Eventually, it evolved into the commonly seen military camouflage patterns known today, such as the U.S. Woodland pattern, which is still used by certain branches of the U.S. military today. When veterans of the Vietnam War returned to the U.S. in the late 1960s and began joining activists in protesting the war while sporting their army camo clothing, it created a powerfully ironic message that caught the eye of both the media and the fashion industry. The curious juxtaposition of a textile pattern that was originally designed for warfare now being used to make an anti-war statement was -- and in a sense, still is -- considered rebellious, and it perfectly embodied the revolutionary spirit of the era. During this time, America was also in the throes of a raging cultural and social battle on its own soil: the Civil Rights movement, which sought to end racial discrimination, segregation, and violence against Black Americans, and which fought for government protection and recognition of the basic citizenship rights outlined in the Constitution. The Movement was characterized by a series of major campaigns of civil resistance, including both nonviolent protests and civil disobedience that spanned over a decade. Spawned from the many cultural, societal, and legislative successes of the Civil Rights movement, the Black Power or Black Pride movement further challenged the established social constructs of the time by promoting racial pride among blacks. This included embracing natural hairstyles such as the Afro. In addition, military-inspired clothing styles, including the incorporation of camouflage, was popular among Black activists who aligned with the Black Power movement of the time. Camouflage fatigues, leather jackets, berets, and combat boots were commonly worn in protest. The camouflage clothes worn by Vietnam veterans turned anti-war protesters and civil rights activists drew attention to the respective struggles of these two marginalized groups. Camouflage soon began growing beyond its wartime origins to represent the battles for change and progression Americans fought during this tumultuous period. Military camouflage continued on its path towards mainstream fashion during the late 1970s, when avid outdoorsman and hunting enthusiast Jim Crumley used a permanent marker to recreate an entirely different camouflage pattern. Crumley drew a series of vertical tree-trunk lines on a handful of the tie-dyed coats and pants that were popular at the time. A decade later, Crumley's patented "Trebark" design went from being sprinkled in a few small ads in Bowhunter magazine to being plastered across the pages of almost every major hunting and outdoors catalog. In a classic twist of irony, Crumley's camouflage camo hunting clothes and gear became so popular that when Panama's notorious military dictator Manuel Noriega surrendered to U.S. forces during his capture in 1989, he was found wearing Trebark gear. In fact, Crumley was reportedly tempted to use Noriega's image in an ad campaign under the slogan, "No wonder it took so long to capture him." Among the trends that identified America during the "Affluent 80s," such as big-hair bands, John Hughes movies about moody teenagers, and emerging computer and video game technology, civilian camo clothes also found a place of pride in popular culture. Then, as now, both teenagers and hunters were going camo clad and began sporting the signature splotches of brown, green, and tan. During this time, retailers attributed camo's success to America's ongoing military campaigns in Grenada and Lebanon. A far cry from the groovy "flower power" sentiment that is often associated with the two decades leading up to the 1980s, ego and excess emerged as almighty during this pivotal decade. This changing dynamic in American pop culture is precisely where the punk subculture and music movement was born, and deconstructed camouflage fashions were soon to follow. As the flower children of the 1960s and 1970s entered adulthood, punk rock soon emerged as a counterculture to the perceived decadence of the late 1970s and 1980s. Soon, the carefully coordinated clothing and preppy couture of the time gave way to torn, ripped, and shredded duds in dark colors and bold patterns such as camouflage and plaid. Accents such as combat boots, pins, studs, spikes, and shaved hair styles accentuated the punk aesthetic, which many found shocking. Similar to the way in which American Vietnam veterans donned their camouflage fatigues while protesting the war a decade or so prior, punk camouflage styles soon came to embody the anti-authoritarian ideologies of that subculture. The growing popularity of camouflage clothing continued into the 1990s, when punk counterculture eventually saw the creation of the alternative rock subgenre known as grunge. Born in Washington State, particularly Seattle, grunge entered the music world during the late 1980s. With a raw sound and lyrics dripping with angst, grunge’s more complex instrumentation -- which was ironically reminiscent of the 80s heavy metal bands that punk rock eschewed -- slower tempo, and dissonant harmonies set it apart from punk music. The mainstream popularity of grunge music gave way to fashions that mirrored its musical sounds. While similar to punk, grunge fashion had its own unique flavor. Popularly characterized by its layered combinations of conflicting patterns such as camouflage, plaid, and even floral, grunge fashions also included oversized clothing, torn denim, leggings, matte lipstick, and thick-soled shoes and boots. Although both punk and grunge fashions break nearly every fashion rule known to man, it’s this intentional disregard for accepted and established fashion guidelines that has, ironically, allowed both styles to achieve mainstream notoriety. Elements of both styles, including camouflage patterns, continue to be worn today after being re-popularized during the early to mid- 2000s by millennials belonging to the hipster subculture. Today’s camouflage fashions are a melting pot of styles that were worn in previous decades and have since been marked by contemporary influences which pay homage to the pattern’s military history. The ways in which camouflage clothing for men and women is worn today continue to highlight the pattern’s cultural and styling flexibility. Ironically, however, modern camouflage clothing is not worn to blend in. In fact, it's quite the opposite. Many of the latest camouflage styles for men and women -- such as the stunning camo couture produced by Christian Dior and other noted fashion houses -- use color, shape, and texture to create pieces that are difficult not to notice. For example, the easily recognized U.S. Woodland pattern, which originally blended blotches of neutral browns, greens, and black has now been reinvented, to include oddly conspicuous colors in variety of intensities that range from pastel to neon. This is perhaps most readily seen in women’s camouflage clothing and accessories, where delicate colors such as pink are used in contrast to the rugged aesthetic of traditional camouflage. Among other things, the popularity of camouflage clothing has inspired the creation of camouflage swimwear and even lingerie. On average, American women spend a cool $8 billion on swimwear annually. This provides the perfect climate for new and upcoming trends, such as variations of camouflage patterns, to thrive. 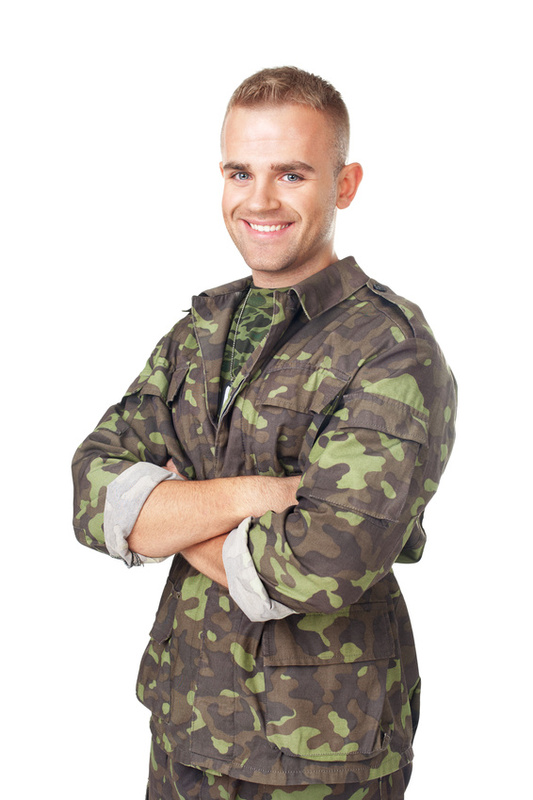 As with women’s camouflage clothing, men’s camouflage is worn by men belonging to a variety of demographics. Though camouflage has a natural association with the outdoors, many contemporary men’s camouflage styles were born from urban inspiration and seek to provide the wearer with feelings of both blending in and standing out, depending on the environment in which it is worn. Based on the geometric patterns, lines, and shapes found in the subway tunnels and other areas of an urban landscape, urban camouflage for men takes the role of step further by providing the user with a surreal experience. While a man wearing urban camouflage at a subway stop may be able to melt into the surrounding tile, the same attire would create a curious juxtaposition in a different landscape, such as a park. America’s long love affair with camouflage -- which has both survived and thrived, decade after decade -- begs the quintessential question of whether life imitates art or vice versa. As America experienced the hardships of the Vietnam War, the unrest of the Civil Rights movement, and rapidly changing social constructs in popular culture, so too did camouflage fashions change. Camouflage was there for Americans during these tumultuous times, and endured through all the changing fads that were left behind as decades came and went. 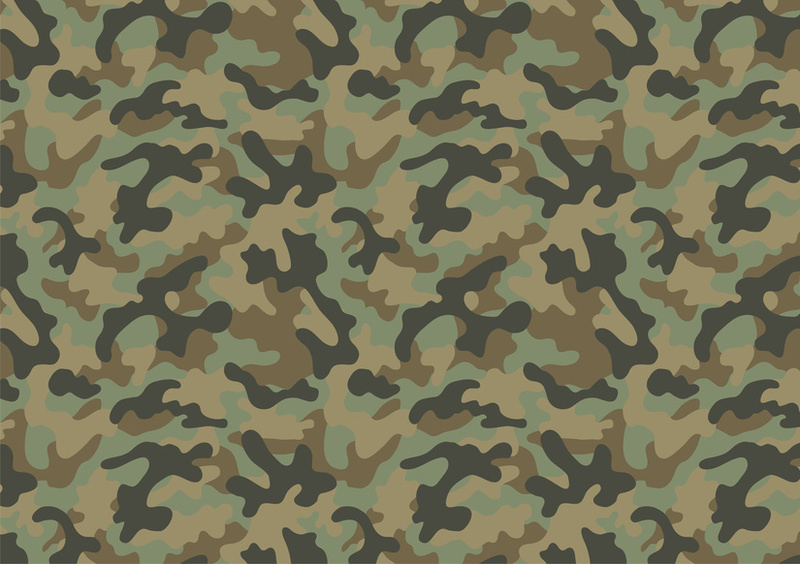 The evolution and continued popularity of camouflage clothing serve as a reminder that the role of clothing fulfills much more than a basic need for covering. Clothing and fashion -- or art -- is a marker of the existing social climate of the time period, and is used as a means of self-expression as well as to indicate one’s status. While the future of camouflage fashions remains to be seen, its past and current use highlights the underlying spirit of individualism and freedom that is at the core of American values.